Well, consider them unhidden now: if you missed a structured place to link bugs.kde.org big/wish reports with KDE Phabricator tasks, look no further. One or more "See Also" fields of the bugzilla (top-right side) are useful points of integration. Example: link, see the screenshot below. 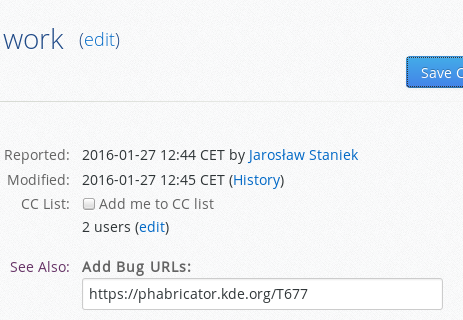 Unfortunately the opposite way does not work yet: Phabricator won't display bugzilla links. But if you use the "BUG:____" lines in your git commit messages they at least appear in summaries of Differential revisions (example). Thanks to Ben who tirelessly enabled the links. PS: These weeks mark end of my 13rd year in KDE!